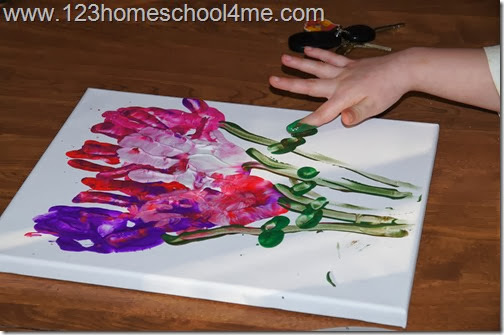 Here is a really fun spring flower inspired hand art craft for kids to make. If you make it on canvas is makes a lovely childhood keepsake or Mothers Day Gift. 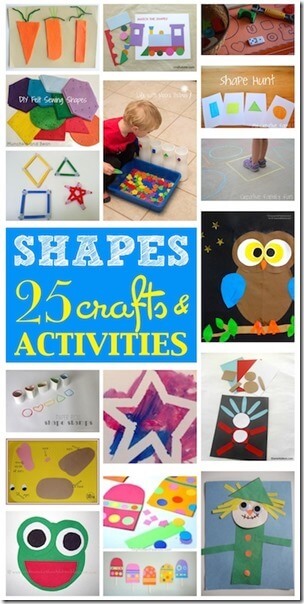 My kids love doing art projects! 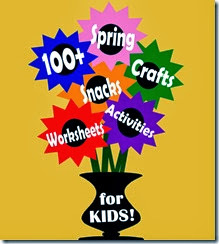 Here is a really fun flower craft for spring. Plus it makes such a lovely keepsake or mothers day gift. 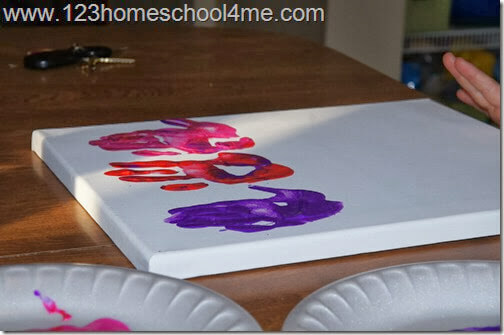 You will need an 11”x 8” canvas (can be easily purchased at Michaels), washable paint in 3 colors of choice + green, paint smock, paper plates, and table covering if you’d like. 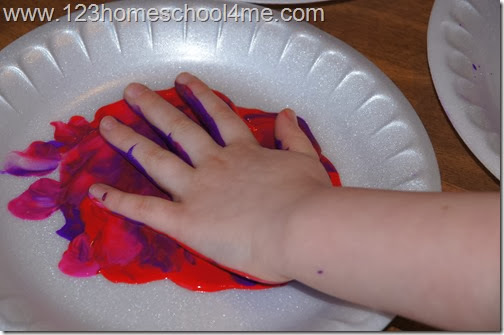 This project is a lot of sensory fun for kids as they squish their hands in the colorful paint. 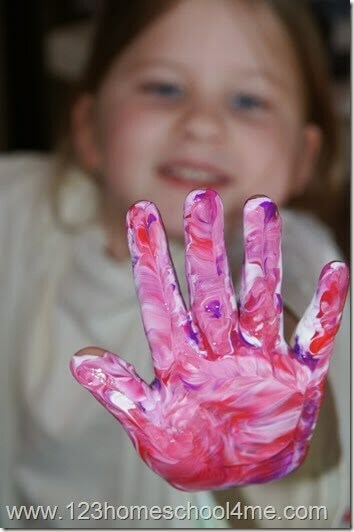 Kids will enjoy watching the colors swirl and mix together on their hands and on the canvas. The beauty of these flowers is that your kids don’t need the added step of cleaning their hands between pressing. 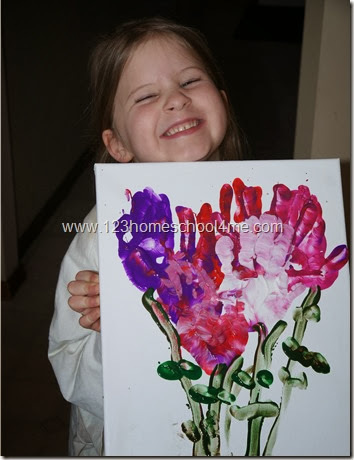 Have your child make prints with their hands on the canvas (shaped vertically) to make flowers. I recommend three across, two in the next row, and one or two random one to give it a non-regulated feel. 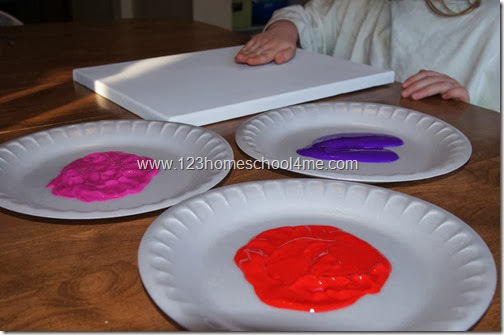 It adds to the beauty of the project to let kids mix paint from several plates. Now that the flower bouquet has been made have your child clean off their hand. Give them a plate with green paint and have them make a stem for each flower. Then make fingerprints along the stem to make leaves on the flower stems. I just love the beauty of the finished hand art project – it very impressionistic art like with our Monet for kids study. My Kindergartner was so proud of her artwork.